We are a leading Manufacturer of fire protection systems from Mumbai, India. Bhavani Enviro Technologies Pvt. Ltd. covers an entire range in the field of Fire Protections with high standards at reasonable rates. We have designed successfully commissioned several Hydrant, Sprinkler, Water Spray, Analog Addressable Fire Alarm and Conventional Alarm Systems. We are also in supply maintenance of Fire Extinguishers. Our portfolio of products and services are used to safeguard firefighters, prevent fires, deter thieves and protect people and property. 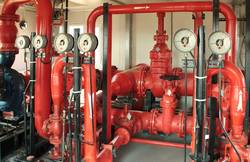 • Fire Protection Systems (Hydrant, Sprinkler, Water Spray, Water Mist, Foam, DCP Systems).